Balancing, relaxing and restoring. In India, Vetiver Essential Oil is known as the ‘Oil of Tranquility’ due to its deeply relaxing and calming effects on the nervous system. Interestingly, this essential oil also has a profound strengthening and restorative action on both body and mind. It strengthens connective tissue, restores the immune system, and brings balance to hormonal and emotional conditions. 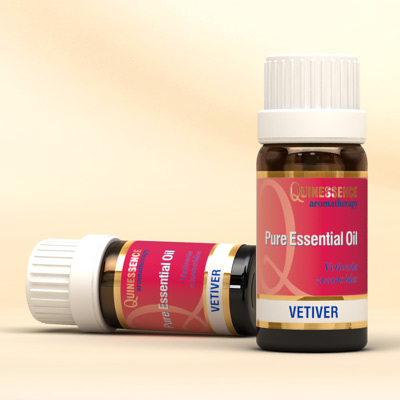 This makes Vetiver Essential Oil ideal for balancing and stabilizing a wide range of conditions associated with the menopause and PMS, as well as having a grounding and calming effect on emotional conditions such as restlessness, agitation and oversensitivity. It’s the ideal restorative after burn-out too. Vetiver Essential Oil is highly effective in skincare for moisturising dry and mature skin, but use it judiciously since the woody, mossy and earthy aroma is quite strong and easily dominates. To create a softer fragrance use equal proportions of sandalwood essential oil with it to create a softer, warmer base note with a highly beneficial, moisturising action.